(CNN) -- Roger Federer and Rafael Nadal are heading for a Davis Cup showdown next year after Wednesday's draw paired their two countries in the first round. 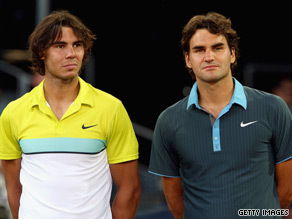 Nadal (left) and Federer have formed one of the great rivalries in world sport. Swiss maestro Federer, who took over as world number one from Nadal during the Spaniard's injury layoff this summer, helped his country to a narrow win 3-2 win over Italy to qualify among the elite 16 counties who contest the World Group. Nadal, who has a stomach strain, sat out Spain's semifinal win over Israel which sees them into this year's final against the Czech Republic as they bid to retain the trophy. Swiss captain Severin Luthi told the official ITF Web site that an away draw in Spain was tough for his side, even if Federer plays. "We have to accept how the draw is. We'll try to beat them in Spain," he said. "For sure that's one of the toughest draws we can have." Federer scored two points against Italy, opting out of the doubles, but has sometimes skipped Davis Cup competition. "It's too early to say if Roger will play or not," Luthi said. Nadal is a Spanish regular and will relish the tie which is likely to be played on his favorite clay surface in the match-up from March 5-7. The draw made in Geneva, also threw up a enticing tie between Serbia, who will host the United States. It throws up the possibility of a Novak Djokovic - Andy Roddick clash, but again the Serbians have the advantage playing on home courts. "It's certainly a huge match, and certainly Djokovic playing in his home country will be tough," U.S. coach Tom Gullikson said. The other first-round matches see Belgium at home to the Czech Republic, Germany hosting France, Argentina welcoming Sweden, Russia at home to India, Ecuador hosting Croatia; and Chile taking on Israel. Spain host the Czech in this year's final from December 4-6.